In 1979, the author published a four-part article on headshaking in the horse. This was the first major contribution to the literature on a problem that had long been a source of distress and frustration to owners and veterinarians alike, not to mention the horse. In this first series of articles, the author described the history and clinical signs of the syndrome and recommended a protocol for the investigation and clinical examination of affected horses. But, in spite of having spilt so much ink, he made it clear that he did not know the cause of the problem and, therefore, could offer no cure. Thirteen years later he published some further ideas on this problem, though still without claiming victory on the vital question of cause and cure (Cook 1992). By this time, many other workers had been researching the problem but none had been able to recommend a really effective cure. Over the last six years, however, the author’s continuing research has provided convincing evidence to support the hypothesis that the most common cause of this problem is facial neuralgia caused by the bit (Cook 1999b, 1999c, 2000, 2002a, and 2003). As the syndrome has been such a recalcitrant problem in the past, it is good to be able to report that here, at last, is a treatment that is both logical and successful. The convincing results provide further compelling evidence that the bit is not only an inefficient method of communication but also one that is physiologically contra-indicated. In the past, many different diseases have been proposed as the hypothetical cause of the seven or more clinical signs that have been thought to define the headshaking syndrome (see Part III, Table I and Cook 2003). Sadly, none of these varied explanations have been supported by a convincing resolution of the syndrome following therapy for any one of the proposed diseases. The syndrome is named after its most prominent and disturbing sign; the persistent, violent, and spasmodic, vertical tossing of the head at exercise. Other characteristic signs include but are not limited to muzzle rubbing, sneezing, snorting, and a general hypersensitivity and shyness when handled around the mouth, face and ears (see Table I in Part III of this article). High ambient temperatures exacerbate these signs and so also does bright sunlight. For this reason, headshaking horses are often described as being photophobic. These apparently disconnected signs can now be economically explained on the grounds that, collectively, they are all signs of facial neuralgia. So instead of having to propose a multiplicity of causes, none of which is entirely convincing, this is a unifying hypothesis that explains all the symptoms of the syndrome under one cause. Happily, the hypothesis withstands the crucial test in that removal of the proposed cause brings about either a complete resolution or at least a convincing regression of the signs. Facial neuralgia is the medical name for a disease that, in human medicine, is also known as tic douloureux and trigeminal neuralgia. It is an acutely painful disease in man, hence the word ‘neuralgia,’ which simply means pain along the course of a nerve. The trigeminal nerve is the main sensory nerve to the face and the largest of all the cranial nerves. In man it is predisposed to a severe neuralgia that is notoriously difficult to cure, as its cause is not well understood. As the name of the nerve suggests, the trigeminal has three branches (Fig 1). One branch supplies sensation to the bone of the lower jaw, its teeth and to the related soft tissues of the tongue, chin, lips and gums. It also innervates the salivary glands and skin of the ear. It takes its name from the lower jaw or mandible and is known as the mandibular branch. Similarly, the second branch supplies the bone, teeth, hard palate, soft palate, nasal mucous membranes, lips and gums of the upper jaw or maxilla. Accordingly, it is known as the maxillary branch. The third branch supplies sensation to the eye, eyelids, tear glands, skin of the forehead and the nearby nasal mucosa. Unsurprisingly, it is known as the ophthalmic branch. The author’s hypothesis proposes that the bit triggers both acute and chronic pain along the course of the trigeminal nerve, i.e. trigeminal neuralgia. The pain may be transmitted directly to the brain or be initiated indirectly, by a process of feedback that results in what is known as referred pain. In this process, pain signals from any tributary of the trigeminal nerve in direct contact with the bit may spread to any other tributary of the same nerve, resulting in pain in areas of the face that have no direct contact with the bit. Fig 1 Shows the distribution of the three main branches of the sensory nerve to the face, the trigeminal nerve. All the reader has to do to imagine the potential distribution of facial pain is to start from any one of the areas that the bit contacts and to follow the red pathway from there to the termination of the nerve in any other facial area. Some horses will have pain or hypersensitivity in the region of the muzzle, whereas other horses may experience this around the eyes, ears or forelock. Direct stimulation of the brain by the acute pain in the mouth is thought to account for the violent head tossing. The more chronic pain probably initiates a dull bone ache rather similar to a bad toothache and accounts for a general tenseness of the jaw, neck, spine and limbs. This would explain the stilted gait and short stride that so many bitted horses exhibit; features that disappear when the bit is removed. When we have toothache we walk gingerly and do not feel like running. The horse may feel the same but when obliged to exercise experiences intermittent muscle spasms in the neck that produce the head tossing. Pain signals will be sent directly to the brain from any portion of the gums, lips, hard palate, tongue, and teeth that the bit may press upon. 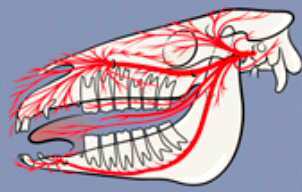 In the male horse, as can be seen in Figure 1, the roots of the canine teeth lie close to the bars. Pain from the canines when the horse is ‘on the bit’ probably accounts for the higher incidence of headshaking in geldings than mares and the tendency for headshaking to be a familiar problem among horses trained for dressage. A few horses of both sexes will have wolf teeth in the lower jaw (as depicted), though they are more common in the upper jaw. Those in the lower jaw will often go unreported because, being vestigial, they may never erupt. They lie under the gum just in front of the first cheek teeth. The indirect stimulation may take the form of hypersensitivity, tingling, ‘pins and needles’ or actual pain. Such sensations in the mandibular branch would explain the resentment that many horses exhibit to being handled around the ears. Referred pain from the bars may also travel down the branch of the mandibular nerve that supplies sensation to the tongue. This could result in the tongue itself being hypersensitive and be yet one more reason why so many bitted horses are ‘mouthy.’ The same mechanism can be invoked to suggest that trigeminal neuralgia may indeed initiate pain in any of the teeth. Referred pain in the maxillary branch would explain the sneezing, snorting and muzzle rubbing of the headshaking syndrome. Indirect stimulation by referred signals down the ophthalmic branch explains the sensitivity to bright light, the rapid blinking spasms, and the shyness to handling around the forelock. Stimulation of the lacrimal glands could also account for the nasal discharge and be a further explanation for sneezing. The clinical signs of the headshaking syndrome represent a pathological exaggeration of a normal response. A healthy horse will respond to a fly landing on its face with a toss of its head. A horse with trigeminal neuralgia behaves as though it is plagued with a swarm of particularly vicious biting flies that refuse to go away. Imagine this, coupled with raging toothache in both jaws, and the reader will have some idea of a horse’s pain. Tic douloureux is one of the fiercest pains known to man. Depending on the duration and severity of the neuralgia, removal of the bit brings about a regression of the signs or their complete disappearance. Affected horses may show a more or less immediate improvement or a progressive improvement over a period of several weeks or months. Presumably, many of these horses will be shown, in due course, to have had bone spurs on the bars of their mouth but this correlation has not yet been made. Most headshaking horses exhibit many more adverse behavioral signs than the seven or so that have traditionally been associated with this syndrome. The author concludes that the headshaking syndrome is simply a subset of the much larger syndrome, aversion to the bit. In other words, facial neuralgia explains the seven or so traditional signs of headshaking but affected horses will almost certainly be exhibiting many other signs associated with the other three F’s of fright, flight, and fight (Part III; Table I). Some respiratory diseases that the author has shown to be caused by the bit include dorsal displacement of the soft palate (Cook 1999a, 2002a), epiglottal entrapment (Cook 1999b), and pulmonary bleeding (Cook 1999a). He now recognizes that the bit is also a common cause of abnormal respiratory noise at exercise and responsible for ‘thickness of wind’ in many horses (Cook 2003). It should routinely be considered as a differential diagnosis for any horse that makes a roaring noise. Laryngeal stridor (‘roaring’) is no longer a sign that we can automatically assume to be diagnostic of recurrent laryngeal neuropathy (laryngeal hemiplegia). Deformity of the windpipe and further obstruction of the airway is a common defect and occurs much more frequently than has generally been supposed. The author is of the opinion that this is a long-term effect of airway obstruction caused by the bit. Finally, this same effect may be a factor in the cause of small airway disease. The tip of the tongue is like the tip of an iceberg … there is a lot more tongue behind the tip. The tongue is a long and bulky organ. In an adult horse it measures about 35 cm (14 inches). A reminder of the tongue’s length can be gained from the fact that its root is suspended from the same bony scaffolding that supports the larynx (voice box). Any thing that causes the tip of the tongue to move, such as the bit, is likely to cause the root to move and, therefore, the soft palate. The tongue is a powerful muscular organ but also a highly tuned sense organ. By taste and touch it selects food and by its motor power it plays a critical part in the mastication and swallowing of food. The tongue has predominantly digestive functions. It is active during feeding but should be at rest during exercise. As in all mammals, the horse has evolved to eat or exercise. It cannot carry out both activities simultaneously. And yet by placing a bit in its mouth this is precisely what man expects it to do. In the exercising horse at liberty, the lips are closed; there is no air in the mouth; the immobile tongue occupies the entire space within the cavity of the mouth and the digestive part of the throat under the soft palate; and salivation is in abeyance. In the exercising horse when ridden with a bit in its mouth, the seal of the lips is broken; the jaw may be frankly open; air enters the mouth and digestive part of the throat; the tongue is constantly on the move; and salivation is stimulated. The above responses triggered by the bit are digestive system responses. All these responses are diametrically opposed to the respiratory system responses required for exercise. Because of these, a bit interferes with the horse’s ability to breathe properly at exercise. Since a running horse takes one stride for every breath, if it cannot breathe properly it cannot stride properly. As these two functions are impaired, together with other cardiovascular functions crucial to exercise, a bit prevents a horse from performing to its full potential. 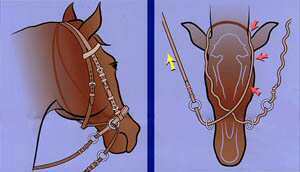 The details of how the bit causes confusion in the horse’s throat have been explained and illustrated in previous articles (Cook 1999b, 1999c, 2000, 2002a). A summary follows here. A cascade of respiratory events occurs in which respiratory obstruction progresses from mild to severe and even fatal. In any one bitted horse, the degree of asphyxiation will vary according to the nature of the exercise. Any method of communication that has so many harmful side effects must surely be classified as contraindicated and unacceptable. But solely because the bit method is painful it should also be regarded as inhumane. Aside from the humanitarian issue, the bit method is contrary to the best interests of a rider aiming at developing a harmonious partnership with her horse and achieving optimum performance. An athlete in pain cannot and will not perform well. Pain reduces both the ability and the desire to perform and is a potent source of accidents to rider and horse. There is no right way of doing the wrong thing. In the author’s opinion, the bit method of communication is faulty, inhumane, and dangerous. He looks forward to the day when use of the bit will be discontinued and these instruments become objects of curiosity in museum collections. If a bit is so bad, why has the method survived? First, much of the evidence that now indicts the bit has only surfaced in the last five years. Secondly, the reason why the bit method has survived so long is that, until five years ago, there was no universally suitable alternative. The situation is rather similar to what happens in the field of surgery. A traditional surgical technique will continue to be used until such time as a better technique is introduced. Thirdly, as with all advances, one can expect a considerable time lag between the first news of the advance and its general adoption. A high degree of skepticism about any new knowledge is healthy for the protection of the public and the integrity of science. As mankind has, for five thousand years, been accustomed to the idea that it is both acceptable and necessary to use a bit to control a horse, it will take time and courage for such a mind set to change. Nevertheless, the good news is that horsemen and horsewomen nowadays are nothing like as conservative in their thinking as tradition might suggest. Many are very open to new ideas and thousands of riders have already switched from bits to bitless. An indication of the degree to which this open-mindedness is rewarded can be gained by reading the users’ comments on this website and on www.bitlessbridle.com. The natural horsemanship movement is gathering increasing momentum and this good for the welfare of both horse and rider (Cook 2001a, 2002b). Why have the traditional bitless methods not displaced the bit method? All three types are potentially painful and open to abuse (Table I). Aside from any limitations currently imposed by competition regulations, these traditional forms of bitless communication are not universally suitable for every horse, discipline or rider. In contrast to these traditional forms of bitless communication and to all the bitted methods, the new Bitless Bridle has the merit of being painless, of providing effective communication for all purposes, and being compatible with the physiological requirements of the exercising horse. Furthermore, it is incapable of being abused and, with the exception of competition regulations that presently disallow its use, it is applicable to all disciplines. For a general comparison of the merits of each of the methods, see Table I. A double bridle is made up of a small snaffle known as a bradoon, which communicates with the mouth as above and a curb bit, which has a leverage action and also applies pressure on the chin and poll. The port of the curb is designed to relieve pressure on the tongue and to actually encourage bar pressure. For the purposes of description it could be referred to as the jawbone vise (vice) method, as – except in the hands of a master - it squeezes the jawbone between two pieces of steel, the mouthpiece of the curb and the curb chain. Because the curb bit is placed lower in the horse’s mouth than the snaffle, the pressure is applied to the bars at the level of the body of the mandible rather than its branches (see Part I, Fig 2). A snaffle bit is more likely to apply pressure to the bars of the mouth over the branches of the mandible, especially if it is placed ‘high’ in the mouth. The Western curb is a leverage bit that is used without any accompanying snaffle. It has a long shank and a spade extension of the mouthpiece designed to apply pressure to the hard palate. It is normally introduced after the horse has been fully trained to respond to a bosal, the curb bit being regarded as the finishing touch for a horse that is already well schooled. When used by a master it is not used, in that the rein is slack at all times. The rein is only used for neck reining, as the curb bit is not suitable for steering. If used by any other than a master it is a painful device because of the huge leverage advantages it offers the rider, coupled with the severe pain that can be inflicted on the hard palate (oral cavity rod plus jawbone vise plus roof of mouth prod). A spade bit is sometimes used in the hope preventing a horse from getting its tongue over the bit. The Bitless Bridle, however, communicates by an almost trivial degree of pressure. This pressure, such as it is, is distributed around the whole of the head, i.e. across the bridge of the nose, under the chin, along the side of the cheek, and over the poll (Fig 2). Furthermore, with the whole-head-hug method whatever pressure is applied at the level of the rider’s hands is dampened before it gets applied to the tissues of the head. Contrast this with the leverage bit method (jawbone vise method) in which whatever pressure is applied to the reins is not only focused on a small area of sensitive tissue in the mouth but is actually magnified three or four times. The crossover feature of the whole-head-hug method means that, even when a horse spooks and a rider instinctively hangs onto the reins to regain balance, the amount of pressure is never capable of causing pain. This means that whatever caused the horse to spook in the first instance is not automatically followed by a sudden pain. The result is that the horse recovers from the spook more readily and does not have a further incentive to bolt. Furthermore, the next time it sees the same monster, it will not associate it with a sudden pain in its mouth and the spook will be less likely to escalate.